The AFA Podcast returns this week with a general catch-up show, concentrating on some of the latest animation news and discussion. 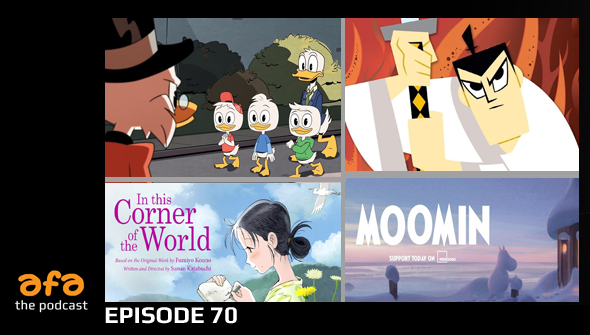 Chris, Rachael and Yvonne talk about the flurry of recent awards ceremonies (The Oscars, The Cesars and The Japan Academy prizes) (0:05) , The new DuckTales trailer (0:22) and the Moomin Indie GoGo project (0:35). Then it's time for our Watercooler discussion (0:53) which this week includes, Samurai Jack Season 5, Escaflowne, Finding Dory and Uncharted 4.